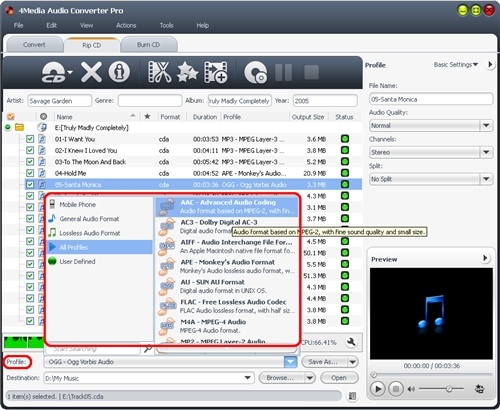 4Media Audio Converter Pro is a powerful all-in-one professional audio converter for audio conversion, audio extraction, audio CD converting and making. 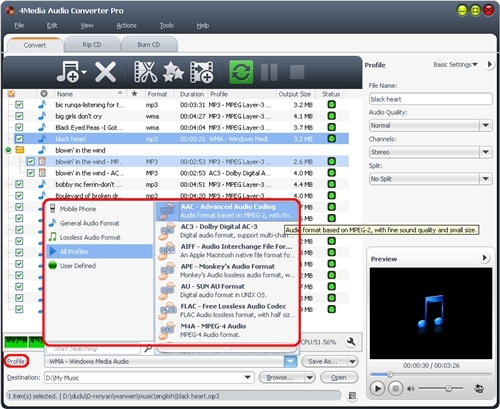 Using 4Media Audio Converter Pro, you can convert between different audio formats including MP3, WMA, WAV, AAC, FLAC, OGG, APE, extract audio from popular video formats including high-definition (HD) videos such as AVI, MPEG, WMV, MP4, FLV, MKV, H.264/MPEG-4 AVC, AVCHD, convert music CD to different audio formats, and create music CD from audio and video files in all sorts of formats. 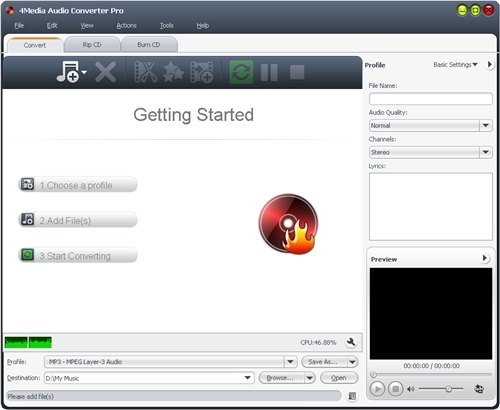 First, download 4Media Audio Converter Pro, install and run it. Click "Add File(s)" button on the toolbar, choose one or more files in the dialog that pops up, then click "Open" to import the selected files into the file list in the main window. Or, click "Add File(s)" drop-down button, choose "Add Folder" option, then select the wanted folder and import all the files in the folder to the file list. Tip:You can also add files by choosing "Add file(s)..." or "Add Folder..." option from "File" menu. Select a file in the list and click "Profile" drop-down button to choose the wanted output profile in the "Profile" drop-down list that opens. Tips:If you want to output multiple format files from a file, you can use the "Add Output Profile" button on the toolbar to add a default profile below the file in the list and change the profile according to your need. Click "Browse…" button and select a folder for saving the output files in the dialog that opens. 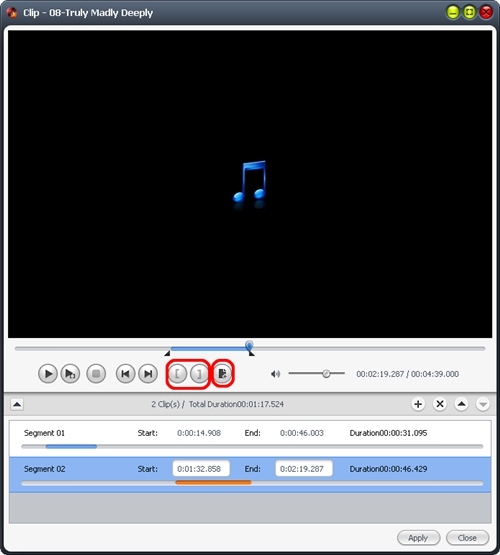 If iPod, iPhone and PSP are connected, you can also click "Browse…" drop-down button and choose the corresponding options in the drop-down menu that opens to let the program transfer the converted files to the connected devices directly. Check the wanted files in the file list and click "Convert Checked Item(s)" button to start converting the checked files. You can check the converting progress by the "Status" bar at the bottom. During converting, click "Pause Checked Item(s)" button to make the conversion pause; click "Stop Checked Item(s)" button to stop the conversion. Click "Convert CD" tab in the main window to switch to "Convert CD" window. 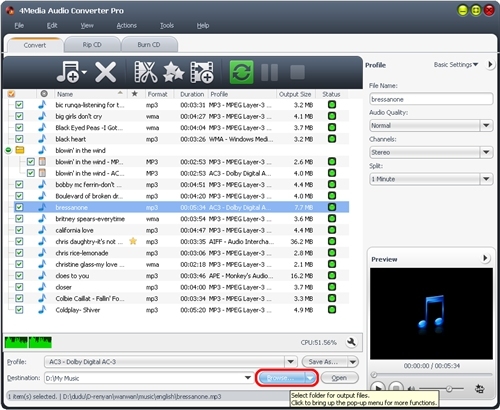 Click "Load Audio CD" Button in the tool bar and load the CD you inserted. Select a file in the list and click Profile drop-down button to choose the wanted output profile in the "Profile" drop-down list that opens. Tip: If you want to output multiple format files from a file, you can use the "Add Output Profile" button on the toolbar to add a default profile below the file in the list and change the profile according to your need. Check the wanted files in the file list and click "Convert Checked Item(s)" button to start the converting. You can check the converting progress by the Status bar on the bottom. During converting, click "Pause Checked Item(s)" button to make the converting pause; click "Stop Checked Item(s)" button to stop the converting. Click "Burn CD" tab in the main window to open the "Burn Audio CD" window. Tip: You can also add files by choosing "Add File(s)..." or "Add Folder..." option from File menu. Click "Profile" drop-down button to choose the wanted CD type in the Profile drop-down list that opens. Three CD types are available: "Music CD", "MP3 CD", and "WMA CD". 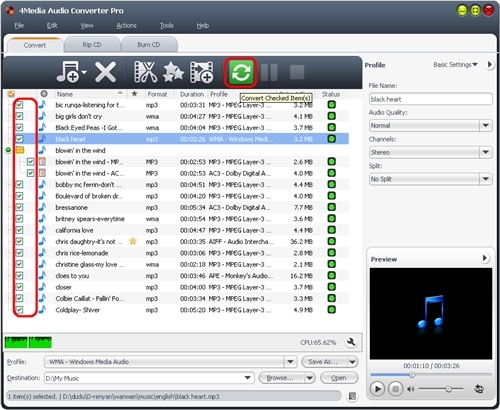 Type the CD name in the "Volume Label" text box. Tip: You can set the burning "Copies" and "Write Speed" according to your need. If you have more than one drive, choose the drive from the "Destination" list. Click "Burn" button to start burning CD. Click "Stop" button to stop the burning if you want. The program allows you to pick out the segments you want from the source file. 1. Choose a file you want to clip in the file list, and click "Clip" button on the toolbar to enter "Clip" window. 2. 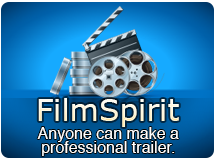 Click "Play" button to play the selected file. 3. During playback, click "Set Start Point" button to set the segment start time when it plays to the point you want, and click "Set End Point" button to set the segment end time to get a segment. The clipped segment will be displayed in the segment list. 1. You can change the segment by entering the start and end time in the "Start" and "End" textbox. 2. You can also adjust the start and end time by dragging the sliders. 4. Click "New Clip" button, and repeat Step 3 to get a new segment. 5. After the above settings, click "Apply" and "Close" button to apply all the settings and return to the main window. The clipped segments will be added below the source file in the file list. Tip: The segment list displays all the clipped segments with their respective start time, end time and duration. This part applies to the effect settings of "Convert" and "Convert CD". Before converting or converting , you can edit audio effects for the output file. To do this, select a file from the list, and click "Effect" button from the toolbar to open the "Effect" window. Check "Fade In/Out", "Normalize", "Band Pass", "Chorus", "Flanger" and "Echo" option on the left, and edit the details on the right. 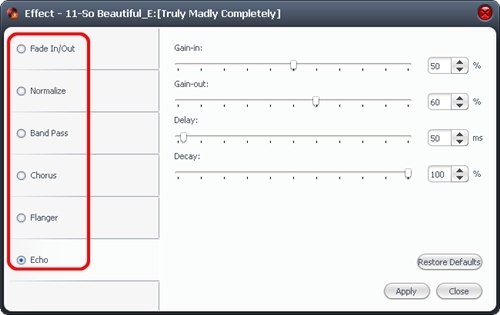 Two editing ways are offered: dragging the sliders or typing the values directly into the textboxes. After all the settings done, click "Apply" and go back to the main window. The program allows you to add multiple profiles to one source file, thus you can output multiple files from one file at one time. 1. 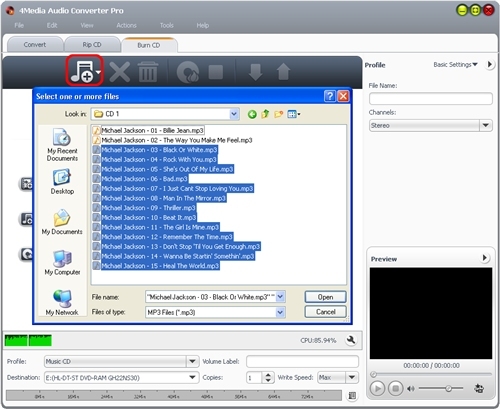 Choose a video/audio file in the file list. 2. Click "Profile" drop-down button, and choose a profile you want from the drop-down list. 3. Click "Add Output Profile" button on the toolbar, then a default profile will be added below the file. 4. Click the added profile, and choose a new profile from the Profile drop-down list. Repeat the steps to add as many profiles as you want to the file. You can choose the columns to be displayed in the file list and remove the odd ones according to your own need. Click "View > Select Column(s)..." option in the main menu to open "Select Columns" dialog, and check the columns you want to display in the file list, then click "OK" button to return to the main window. Click "Up" and "Down" buttons to adjust the display order of the columns.